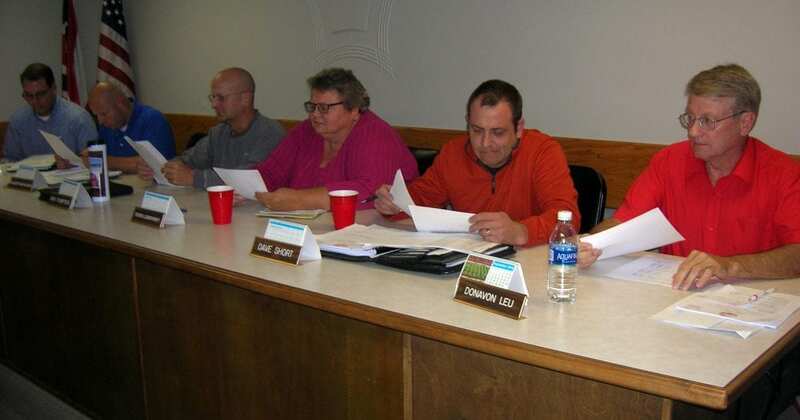 Members of the West Unity Village Council convened in regular session on the evening of October 13. Village Administrator, Joshua Fritsch, reported on the ongoing Jackson Street Waterline and Storm Sewer Replacement project. He noted that the assumption that Phase II of the project would connect with Phase III, and carry on eastward on Jackson Street out to County Road 21. He reported that recent discoveries in the existing lines showed that the aforementioned assumption proved to be incorrect, and that it might be necessary to bring the construction back to the west. Lee Rausch of Poggemeyer Design Group addressed Council on the findings, and offered four different options on proceeding forward with Phase III. Option #1 was to continue forward as originally planned and bid, with costs of 84 linear feet of Type B 12” storm sewer, 1,109 linear feet of Type C 12” storm sewer, 7 Type 2-2B catch basins, and one storm manhole for a total estimated cost of $166,053.50. Option #2 redirects the flow back to the west. Additional materials needed for Option #2 include 225 linear feet of Type B 12” storm sewer, 525 linear feet of Type C 12” storm sewer, 2 Type 2-2B catch basins and another storm manhole. With engineering fees included, this option comes out to an estimated $214,593.50. Option #3 does away with the storm sewer work entirely, reducing the costs to an estimated $107,206, but also effectively turns away almost $42,000 in CDBG and OPWC grant funds, which Mr. Rausch and Mr. Fritsch both agree is highly unadvisable. Option #4 again calls for construction as bid, with the county to work with residents and the village to petition for storm improvements. The costs would be the same as Option #1, but the outcome of the petition is not guaranteed. Council deliberated and discussed the options at length, and almost immediately dismissed Option #3 as not an option, as it might affect future grant funding in the future. Further discussion ruled out Option #4, and after more discussion on the depth of the lines and the discharge, Council agreed to Option #2. Mr. Rausch also discussed the advantages of replacing current street lighting with LED technology. Studies have shown that LED lighting not only lasts substantially longer, but can reduce energy consumption costs by over 60 percent. Under suspended rules of reading, Council approved two ordinances. Ordinance 2016-9 revised the 2016 Annual Appropriations, with a total budget listed at $2,456,578.63. According to Village Fiscal Officer, Kim Grime, the State of Ohio and the Judge of the Williams County Common Pleas Court, J. T. Stelzer, have approved a transfer of $500,000 from the Debt Service Fund to the Sewer Fund. Council also approved Ordinance 2016-10, allowing Mr. Fritsch to enter into contracts with the Director of Transportation necessary to complete the resurfacing of US 20 in the Corporation Limits. Mr. Fritsch reported that on the weekend of September 17, there was a water main break at the intersection of North Liberty and Parkway. Mayor Peg Bernath reported that the Chili Cook-off was a huge success. She thanked the West Unity Chamber of Commerce for their efforts, and noted that the annual Chamber of Commerce banquet is coming up on November 9. The West Unity Police Department will be honored at the upcoming event. VFO Grime produced a newly released blueprint for the new Village Office, with will be located in the vacant clinic building just to the west on Jackson Street. Mr. Ron Hausch addressed Council about a proposed partnership project. Having recently returned from Lancaster, Ohio, he noticed something there that he felt would be an ideal project in West Unity. While in Lancaster, he noticed a ‘Tree of Peace’ that was planted in honor of those who have served the nation as a part of the American Military. The idea of Mr. Hausch would be to form a partnership between the Village, the Chamber of Commerce and the West Unity Lions Club to do the same thing in Wabash Park. Mr. Hausch noted that the Lions Club and the Chamber had not yet been approached with the proposal, but Mayor Bernath gave her support, saying, “I think that’s a great idea.” Although no vote was taken on the matter, Council was receptive to the idea, and Mr. Hausch will report back on the response received from the other two proposed partners. Be the first to comment on "West Unity Village Council Moves Forward On Storm Sewer Project"